A view from the cycle path: Recent events in London - and superhighways ? Two recent events in London give a good example of what works for increasing the level of cycling and what does not. First, Cycle Fridays. This is an attempt to get Londoners to cycle to work by accompanying them on the roads. On Fridays it's possible to ride with other commuters through the traffic to get to work. Six different routes to four destinations are on offer. On the best day so far, this attracted just 88 people shared between the six routes. Second, the London Sky Ride. This involved closing 15 km of streets to provide a car free experience. 50000 people took part. Even that is only 0.6% of the London population, but it's orders of magnitude more than were tempted by Cycle Fridays. I've said it before, and no doubt I'll say it again. If you want to see mass cycling, the experience has to be pleasant, safe and convenient. Riding in London traffic doesn't score very highly for any of these things, which is why it was less popular than "Sky Ride" which at least achieved two of them. In attempting to grow cycling, Britain seems willing to try almost anything other than the only thing that actually works - which is... building proper infrastructure for cycling. TfL's idea of a Superhighway. with a bus in it. 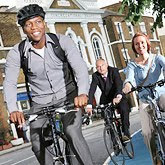 London has made a lot of bold claims, but when you look at the details on the TFL website you find that their idea of a "cycling superhighway" is a strip of blue tarmac on the road as shown to the left (they've since removed this photo and put on some others which are equally unconvincing). They're not exactly aiming high. Even the artist's impression shows a bus in the cycle lane. This ought to be the "before" photo of a set of "before" and "after" photos, not what is being aimed at. It's really not remotely enough to attract mass cycling. Perhaps London ought to aim for something a bit more like this, which is not an artist's impression but something retrofitted to a few km of streets in Assen a couple of years ago. Get people away from the cars and they're more likely to be attracted to cycling. Oh, and it's a good idea to make sure that bus stops are more like this, so that buses don't cut across cyclists. Buses and cyclists can co-exist very well, but not in the same lanes. Neither of these examples of Dutch cycle-paths are described as superhighways, of course. They're simply efficient city cycle paths. Junctions on them have been shown previously. 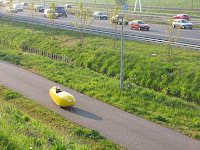 Dutch superhighway by busy road. The Netherlands also has "superhighways". They're called "fietssnelwegen" and are inter-city routes. These are built to high standards, 2.5 m minimum for single direction, four metres wide if bidirectional. So far as possible they have priority over side-roads so that cyclists can make uninterrupted journeys over long distances. The idea of these is to provide a network of fast inter-city routes right across the country which lure people from cars even over longer commuting distances. It has been shown that building even these is cheaper than not building them. I have a similar path, though with somewhat more separation from the motorway, on my commute. It's designed so that high speeds are possible and I typically stop just once in 30 km. Another thing London needs to address is that they are simply not aiming to put the routes close enough together for them to be effective. This was researched by the Dutch back in the 1970s, results were published. A very fine grid of subjectively safe cycle routes is essential for a high modal share. This successful policy has been followed ever since, leading to the Netherlands having the highest cycling rates in the world. Why try to re-invent the wheel ? And why do so badly ? Shortly after writing the text above I noticed something else very odd about the first fake photo from London. The cyclist is scaled down relative to everything else and is no taller than the gray car which is about the same distance away. This gives the impression that the cycle lane is wider than it is. And another thing. I've had a few people say that London adding cycle lanes is a good thing and that I shouldn't be complaining about it. Here's the explanation: Yes, adding cycle lanes is a good thing. However, if they're going to describe them as "superhighways" then a bit more effort is called for. Compare what's on offer with a mere "fietsroute+" in the Netherlands, or indeed just an average "cycle-path". London is planning down to a level such that it will fail to product a high modal share for cycling. Update 11/10/2009: London has produced a video display which works by pedaling an exercise bicycle so you can see how the "superhighway" will look. This also doesn't look particularly impressive. 9/11/2009: TFL changed their website to get rid of the "artists impression" with the miniature rider above, replacing it with the super cheesy "supercyclehighway-man" seen on the right. 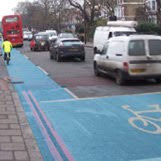 In other news, the "superhighway" is now revealed to be a 1.5 m wide cycle lane on the road, with the only unique feature being blue paint. Given that the minimum recommended width for an on road cycle lane in the UK was already 1.5 m, with 2 m being recommended in areas with more motor traffic, this doesn't sound all that "super"
What's more, the standards where we live now call for single direction cycle paths to be a minimum 2.5 m wide, and bidirectional paths to be 4 m wide. They are separated from the road by a minimum of 1.5 m. That's the measure of a "cycle path" here, without the hyperbole of calling it a "super" anything. Finally, to see more about cycling "superhighways" in the Netherlands on a completely different scale (intercity routes which will cover the entire country), look at the other posts tagged with superhighways. These join up a dense network of routes which already cover the whole country. We operate cycling study tours and would be very pleased to be able to help London to come to grips with what is required to achieve a genuine cycling revolution. For more on the London "superhighways", click here. Don't worry that decent infrastructure costs too much. It's cheaper to invest in it than not to. Even the benefits to employers add up to rather more than is spent. So go on, London, do a proper job ! Trying not to covet these gorgeous bike paths - I want to keep enjoying my biking here. Which may be harder to do if I know what I'm missing! Unfortunately, if you ask many UK cyclists if they want separated cycle provision and they'll throw up their hands in horror. We've seen so many of the first kind of bike lanes you show, and worse, we can't seem to conceive of anything better. So any campaign for better provision seems to get hung up in a dispute about vehicular cycling, and the politicians can continue on their merry way with their pots of paint and their half-metre wide lanes and cycling continues to be for the fit, fast minority. Hi David, whilst I don't think Cycle Fridays and Skyride are comparable (one is aimed at nervous first time commuters riding to work, the other at families having a day out; one is organised by a charity, the other by Sky broadcasting and thus had a huge marketing budget) I think that they are both valid exercises. Incidentally, the charity that organises Cycle Fridays did the same escorted rides leaving from all over London to feed into the Skyride last Sunday and were hugely popular. Although I commute to work by bike every day I went on one of the escorted ride on Sunday to see who was going along and it was great seeing nervous Mums, kids, Dads, grand-dads all getting on their bikes in a group and cycling on the roads into London - I guess it's one converted soul at a time over here, but every little helps. Anyway, I think your post about cycle lanes has summed up perfectly what I've been trying to explain elsewhere in the blogosphere without so much eloquent success - that is to say, if you're going to build bike lanes in London make sure they are GOOD bike lanes and not crappy old splashes of paint in the road with buses driving over the top of them! The problem is that in London and many large UK cities the roads simply could not fit an off-street cycle lane, full stop. There are many out of the cities, I used to commute 17 miles by bike, 10 of which were off-road cycle lanes, but into the city what we really need is better cooperation, not strips of painted tarmac or separation from other drivers. If you want to be accepted on the road you have to be ON the road and follow the same rules. Each piece of infrastructure used to separate drivers and cyclists seems to do nothing but make the anger and difference between the parties even greater. Must not upset the Motorists,keep all them Cyclists out of the way. Send them off all over the Place away from the Cars. Let Motorists have Direct Access to where they want to go but send Cyclist off down Allyways and into Dead Ends and Cul De Sacs. Wherever Possible Cyclists must Dismount to give Motorists the Right of way.Put in 1/2 Metre or 2ft wide Cycle Lanes Painted on the Road do not on any Account Narrow the Roads to put in a Dedicated Cycle Path. *sigh* I live in Canada but my family is from Amsterdam. I tend to agree with your posts but I must say, I rolled my eyes on this. You posted a picture of London bike path painted in a nice blue lane. The bikes path is not only bright, but it does look like the bikes have space too. There are many bike paths just like that in Holland, not every bike path is separated. Also, London’s bike path is a improvement from what Toronto provides. Some 'bike paths' are just a line, the with is so thin, it's only the width of my foot. To have people want to ride their bikes, the city needs to enforce punishment to people who drive on the path. In Holland, drivers are afraid of hitting bikes because they know they will get punished. I would LOVE to have a path like London’s. You’re just being picky now. The Netherlands has really spoiled you. Townmouse: Yes, I know. However, at some point, if more than a tiny percentage cycling is actually the aim, Britain has to actually grasp the nettle and make a start on decent provision. As for fast... There are a lot more fast cyclists here than in the UK. MarkA: I also think both are valid. Anyone trying to achieve something is at least trying. And yes, they do need to be good. Very, very good if you want to attract everyone to cycling. James: There's more space than you think. The Netherlands has just as many narrow streets, but they're no longer through routes for cars. It's not true that "Each piece of infrastructure used to separate drivers and cyclists seems to do nothing but make the anger and difference between the parties even greater." After all, there's plenty of it here. What causes the friction is the "them and us" feeling between those who cycle and those who do not. In the UK, 2/3rds of people haven't cycled in the last year. In NL, 93% of the population cycles at least once per week. Get the masses cycling and "them and us" goes away. Victoria: Yes, it's true that "not every bike path is separated" in the Netherlands, but the overwhelming majority are and we need to make sure we take things which are comparable. Let's take this city, Assen, as an example. The figures I have from a couple of years ago show that in this city there are 108 km of separated cycle paths (where they are on both sides of the road, this is counted just once) and just 14 km of cycle lanes on road. The on road cycle lanes are on roads which never see the volume of traffic that you get on many of London's roads. I don't think I'm being "picky" at all. The cycle lane shown for London simply isn't of good enough quality to attract many cyclists. I have to agree with MarkA - they are different and good in their own ways. Many would say the numbers of the SkyRide are irrelevant because people will still just see cycling as a recreation activity, not as utility for transport and day to day living. Whereas the smaller numbers of the Bike Friday cyclists are genuine increases in utility cycling. I think we (individuals) can and should promote cycling as safe and useful. And presure the government via cycle organisations to put in NL level cycle infrastructure. Of course one issue is continuity or the joined up aspect. When you put in the first new wonderful (NL level) separated bike lane, it's still going to come to and end and dump you somewhere less favourable. Is there a way to transition gracefully or should there be a mega project to put in whole routes at a time. (Please can you put the full article back in the RSS feed). Neil: The events are of course different, but the numbers drawn to them are fantastically different. That's the point really. While cycling is not pleasant enough in London, people simply won't do. Junctions can be made to transition gracefully between almost anything. It's extremely rare to find anywhere here that is jarring at all. The junction that this post is about is a join between two different styles of unidirectional cycle path to west, north and south, cycle path and a bidirectional cycle path to the east. It works just fine. A video made a bit further south on the same road shows merging from a road with no cycle path. "A mega project" is required just to stop Britain falling further behind. Far more ambitious projects continue to be started and finished here, so delaying further simply means there is more catching up to do.